Soft, gel cushion pads with zippered closures. Increases comfort for Rollator users. The Synergy Gel Rollator Handle Covers are designed to provide the ultimate in Rollator comfort and skin protection. Rollator users will find these gel pad covers can aid in healing sore hands. This pair of Gel Rollator Handle Covers increase comfort for people using Rollators, the 4 wheel walkers with the wide and unusually shaped orthotic grips. These gel hand pads zip on over the open end of the grip and on top of the existing handle. The gel pad is placed on top of the grip. When the zipper is closed, the cover fits securely and will not twist or turn. The Gel Rollator Handle Covers do not fit traditional U shaped walkers which require a pad that is open at both ends. Synergy Gel Ovations™ products incorporate a latex-free, solid gel and have a durable neoprene nylon surface, which is soft, easy to clean, and highly efficient at distributing pressure. The gel covers protect bony prominences, reduce abrasions, shear, and harmful pressure-related problems. Fits: 4 wheel walkers with the wide and unusually shaped orthotic grips. Measures: Approximately 4-3/4 inches long, 1-1/2 inches in diameter. Materials: Medical grade silicone, solid polymer polyurethane. Love love love these! My palms were breaking down and cracking from the hard plastic when I use my rollator . . these were a life saver! Absolutely fabulous. My calluses are very grateful. Will be ordering another pair. Hesitated at first because I thought the price was rather high, but once I received them, the quality is well worth it. I think you would have them available on every walker site. My daughter found them on the net. My thanks. ALTHOUGH THE GEL PAD IS VERY COMFORTABLE THE ZIPPER IS NOT. 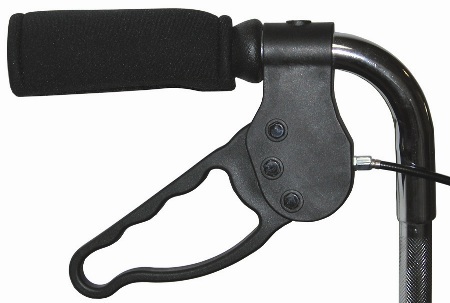 I HAVE TRIED NUMEROUS POSITIONS ON MY HANDLE SO THE ZIPPER DOES NOT IRRITATE. THE TAB AT THE TOP OF ZIPPER IS THE WORST. ANY SUGGESTIONS ON HOW TO AVOID THIS PROBLEM? The length of the covers was just right, but I would like to have more padding because I have carpal tunnel syndrome. Mine is not a Rollator, so it was a little loose and I lost one the first day, but someone found it. I secured it with double sided velcro tape. It seems expensive for what you get. Doesn't conform to the hand rest so it turns and twists. Isn't thick enough. Overpriced. Zipper is sharp and turns so it cuts into fingers often. Q: My rollator has black plastic handles that are not totally round. The section in between your palm and thumb is flat like some bicycle handles. Will these gel covers fit over these type of handles? A: The Rollator Handle Covers are stretchy, but I think it would probably be asking too much to get these to stretch over those handles. Q: Will the rollator grips fit a Drive rollator? A: Fits: 4 wheel walkers with the wide and unusually shaped orthotic grips. Q: What are the measurements of these gel grips? A: The Gel Rollator Handle Covers are approximately 4 3/4 inches in length and 1 1/2 inches in diameter. Q: Is this 28.95 a pair or individual? A: Sold as: One pair.